Part of my daily weekday routine is to stare at my cupboard, till the time I realize that I am running late and, pick up anything random and wear that to work. Now, the dress code at my work place isn’t strict, so I can wear anything I can. I can be fashionable or just look like I dragged myself out of bed. Mostly, I am under the second bracket, but honestly I don’t like that myself! But, if I get an option to dress nicely every day I would, only if it happens without the hassle of deciding what to wear. 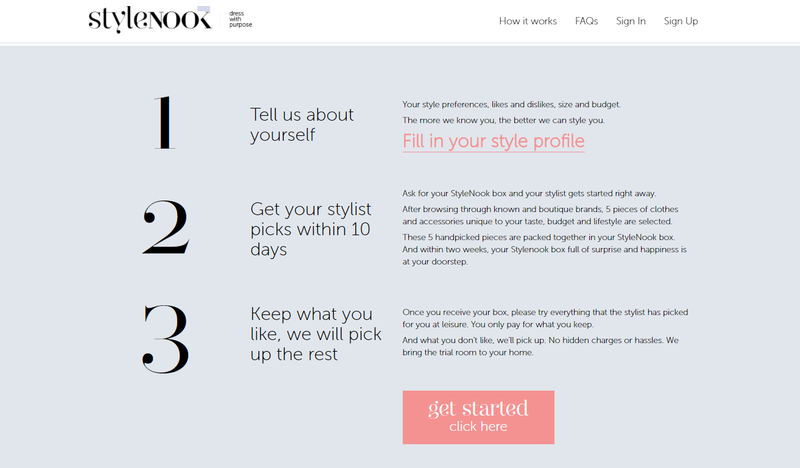 Now, when I bumped across Stylenook.in, a styling service especially for working women, on facebook, I jumped in to give it a try. Because, let’s not kid ourselves, we all need a bit of help to dress up on a working day! Let me tell you a bit about Stylenook and then I’ll tell you about my experience. StyleNook, is perfect for the woman on the go, who needs to look her best at work and has no time to invest, to decide what to buy and go shopping for the same! All you have to do is, fill in your style profile, such as what sort of prints you like and dislike, you measurements, do you prefer western clothes or Indian clothes, etc. And then place the order. Your stylist will give you a call to better understand your taste and what exactly your requirement is, and in the brief call you will just have to fill her in with your needs. 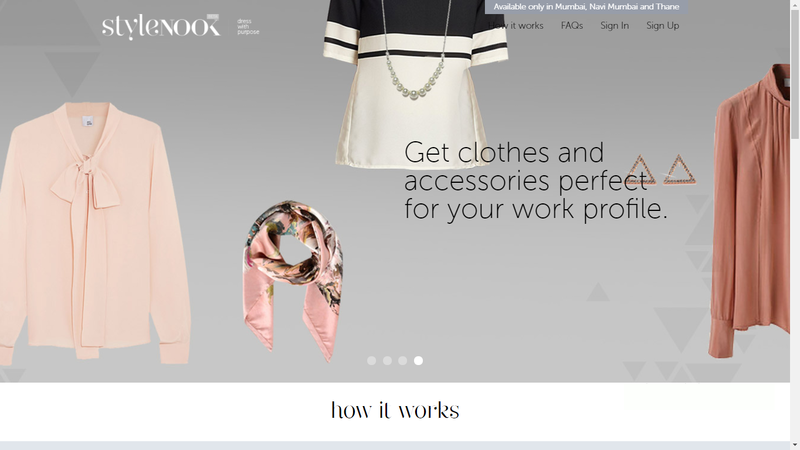 Within a couple weeks, you receive your box with the clothes your stylist has picked for you. Try them on and decide if you like them or not. If you like them, you keep those pieces and only pay for them. And simply, raise return request for the clothes you don’t want to keep. Now coming down to my experience, I followed the steps above and ordered my box. I received the box in less than a couple weeks’ time. If you have watched my instagram stories last week, you’d know what my view for each item was. In my box, there were 5 items; A dress, a shirt, a wrap shirt, a skirt and a scarf. I liked everything in my box, apart from the scarf, but unfortunately the size of the items I wanted to keep was a problem. I wanted to keep the dress, the two shirts and the skirt. But, three of them had some or the other problem with the size. So, I decided to return the whole box and order another box with more detailed sizing data from my side! It is as easy as that. And you only pay for the clothes; there are no extra charges for the styling or anything! Will update you soon on what I received in my next box! Hey everyone! So my second box from stylenook is here! After some size and choice issues with the first one, I had a long conversation with my stylist, Laxmi and she asked everything about my lifestyle and what I wear usually and what resonates with me when it comes to clothing. This was all to understand me better. And from what I understand, that this happens sometimes and is quite common for the StyleNook team to send a second box over. And this time, the box was absolutely spot on. There were 5 pieces of clothing, but I kept only four, because one had a bit of a size issue. So, here are the four things that I received and this is why I chose to keep these. I was really happy to receive the dress I loved from the first box, in my size! The two shirts which I received are from a brand called Uptownie Lite. The pink checked shirt can also be worn as a jacket and is perfect for the season. Mustard being the hot colour of the year, is required to be in my closet. This shirt with a bold collar does the job well! The teal belt is my second most favourite in this box, after the dress! It is perfect and is completely my style! All in all, I am quite happy with the service I received the second time and I would recommend all you working women to leave your work closet on these brilliant stylists, and they will have you dress perfectly in no time!